Fear and hatred towards refugees should be turned towards those who put them in their situation. Over the last year, over a million people illegally crossed the borders of the EU. This is three or four times higher than in 2014. The effect on the world’s largest economy was insignificant, but the media has worked hard to show otherwise. Although winter slowed the migration, the ‘refugee problem’ was still manipulated by journalists, politicians, and government/intelligence agencies for their own personal goals. People have reached our border and are asking us to let them in. Should we take care of these people, or should we turn them around? Do we choose solidarity or security? We have been placed at this decision by the our “defenders” and opponents of refugees. However, the problem is of a very different nature. The uncertainties of these new arrivals are many – how many are there, where are they from, and what kind of people are they? If we want to answer these questions, we can look at government data, however uncertain that is, and the situation in Bulgaria – where in less than 25 years, over 25% of the adult population left the country. The refugees that reach the EU aren’t the poorest nor the toughest of their respective nations. Those in the direst situations don’t get far – if they are Syrian, they are probably in Turkey, Lebanon, or other neighboring countries. 60% of the arrivals in the EU are young healthy men with a clear goal – a standard of life similar to the EU. In front of them is a clear example – millions of people from their countries have achieved this in EU. They are not afraid of borders, because the borders have been removed long ago. There are no borders for the ‘international police’ mandated by UN, NATO, or the USA who authorize themselves to police entire nations. There are no borders for petrol, gold, and other resources which flow from poorer countries to richer. There are no borders for bombs, which are dropped in the countries that have the most refugees. There are no borders for the cheap workers of foreign European colonies, who have spent the last decades washing European dishes for their children to be born as European citizens. Today millions of their descendants fill ghettos of European capitals as “second hand Europeans”, surviving with state assistance, while some are so disgusted by Western civilization that they join ISIS. Still, millions of their friends and kin are risking their lives to join them with the hope of “living a normal life”, not “to be integrated”. The real problem with refugees isn’t that they don’t want to be integrated, but that they are already integrated. In today’s global economy, entire peoples are turned into a national resource – a population of slaves on exploited territory where they act as a reserve for cheap labor. The battle of the refugees is to turn them from a natural resource into dishwashers. Even if a couple of million people run away to a better life, beyond the crumbling EU borders will remain billions who don’t like their role as weeds in the field of the global capitalism. In its most basic form, the refugee wave is a migration of the hungry to the bread, even if there is barbed wire guarding it. Today they are not that many, but if the hunger continues, tomorrow there will be many more. And the next time, they won’t be as friendly. Of course, there is no dangers of reaching actual clashes between repressive states and organized refugees – state influence over European citizens is currently at an all-time high. The mafias ruling over the poor countries will probably be forced to mitigate the effect of social instability in well-known way – to turn the conflict political. In one of many possible scenarios, Turkey can try to transfer its internal problem in areas liberated by Kurds into an outside problem, by starting a local war with its historical enemy, Russia, or by liberating “historical Turkish land” such as Kardzhali in Bulgaria or occupying parts of Syrian Kurdistan (Rojava), in the name of peace. In another scenario, Bulgaria, will have to deal with its preassigned role as a prison and a threat for hundreds of thousands of refugees in order to keep the peace in Western Europe. Every similar scenario would be a result of the huge gap in the standard of living between the ‘West/North’ and ‘East/South’. The gap has never been this deep, while the geographic distance between the two groups can be passed by a few hours on an airplane. This gap will not be closed, regardless of whether we accept the refugees, shoot them at our borders, or send them on their way to Germany with our warmest regards. Well then, what is there to do? Geographically (and even social) speaking, the Bulgarian people are at the edge of the gap, the border which must be overcome if we are to live “normally”. It is understandable that most of us are scared of the flow of refugees – intuition tells people that behind the harmless groups of immigrants which the government settled around the country lies a significant problem, able to fundamentally change the world as we know it. It is good to know that, regardless of this, there are people who turn their feelings into solidarity, into real help for the people that left their homelands. Surprisingly, that so few from a people such as ours, who traditionally pride ourselves of our hospitality. Exactly why is obviously very complex, and it would be hard for us to explain it in its entirety. We will still point to one factor, which all other analysis of the issue would ignore – the blood ties between The Bulgarian and Bulgaria. From the wealthy businessman to the vagabond under a bridge, all are complaining about the state. At the same time, the state is the only thing which we can turn to for help, even elementary problems such as crime, simply because it ensures we have nobody else to turn to. The case with the refugees is a clear example. If we truly ruled our own lives, the passing of thousands of people through our territory would be our problem and we would definitely have to establish a corridor for them to pass through. But as we are ruled by the state (through a self-appointed band of MPs), the state sees the refugees as a problem that it can use to tighten its control over us, acting as if they are a livestock, obeying the richer states and crying that Bulgaria doesn’t have enough money. If we don’t like this, if we want to help these people out of basic human solidarity, we are forced to beg the state to change something, because the state makes it so there is no other way to make a difference. Maybe this sounds unbelievable to some people, but it should be clear to anarchists. We are in solidarity with people who need help, but we don’t make any illusions that the help we give would fix the real problem that made them flee their homes. Truthfully, the state allows only actions which maintain the status quo. The best solidarity we can give to refugees would be to send them where they want to go, but this is exactly what the state won’t let us to do. The solution to the real problem (which would be the elimination of the causes of the problem) will not happen easily nor quickly. However, it is sure that it will happen regardless of the countries, imperialists or colonies, that caused them. The refugee problem creates cracks in the world order, in which we should drive wedges into in order to bring about real change. 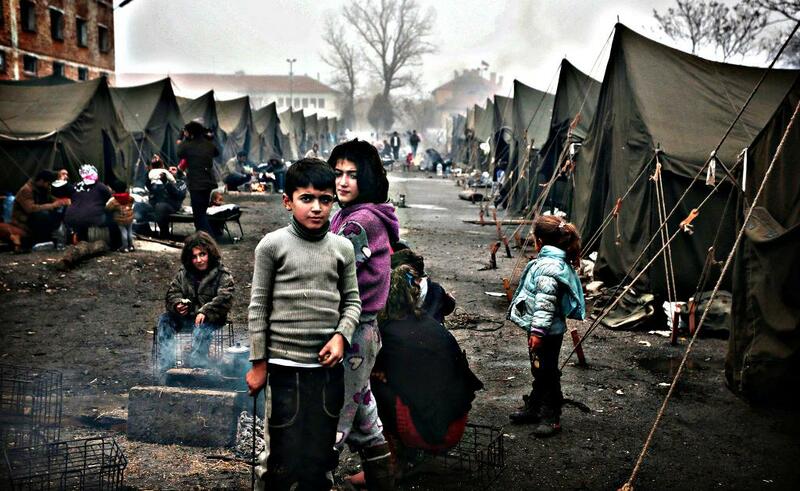 The refugees are undoubtedly demonized in the public mind in Bulgaria (but are not in last place because treacherous “care” from a government which satisfies no one but itself) but even more demonized are the causes of their poverty – governments, companies, and armies who turn nations first into resources mines and then into battlefields. Their roles in producing such misery should come naturally to people with a country such as ours, a crossroads for conquerors, a modern destination for alcohol tourism, and a source of cheap labor, from which 2 million people have also fled. Fear and hatred towards refugees should be turned towards those who put them in their situation. This doesn’t look impossible, while fear and hatred motivate resistance to authority. For now, unhappiness doesn’t reach further than complaints sent to the state because the threat is not yet real. However, the refugees remain marginalized, low paid, outcasts of the “normal country”, and while there is the possible scenario of changing Bulgaria into a refugee detention center, we can also expect the refugees to clash with the local population, with religious or ethnic messages, but with social roots. The state would not be able to prevent or handle this conflict, because of it will be a social issue. Then the ability to self-organize against refugees could be turned into attempts to resist authority. Even the actions of charities which maintain the status quo can be utilized to look for cracks in the status quo. With the right conditions, the refugees themselves would be able to turn into a factor against the state, especially if the state plays the role of the “corrupt” police state that does not let the go into “normal” Europe. Everyday people participating in action of charity themselves can be radicalised if they realize that “power” is exposed for consistently getting in the way while claiming it is trying to help. Everyone will agree that solidarity doesn’t end at the borders. Shamefully, it often starts at the borders. Solidarity from anarchists isn’t a knee-jerk reaction to the status quo, but a tireless search for roots of problems and their solutions.